Today we’d like to introduce you to Shivaun Palmer. Shivaun, let’s start with your story. We’d love to hear how you got started and how the journey has been so far. Plaid for Women was founded in 2012 to create a “go to” digital platform for women to find substantive content on the “Business of Life”. Five years later, the platform has grown and includes original content five days a week on Career & Money; Health & Wellness; Home & Family and Inspiration. Plaid has over 60 women content contributors from across the U.S. Content includes blogs, radio podcasts and short form videos. The company embraces a #NoMeanGirls culture encouraging women to love themselves FIRST (not be mean to themselves) in order to achieve their personal and professional dreams and to respect other women on that same journey. The name Plaid was a result of a marketing whiteboard session wanting to come up with a name that would be “sticky” like Google, Yahoo. Plaid was suggested. It is a metaphor for our audience – different colors, different fabrics, different iterations, but at the end of the day, we all connect at the same point. Plaid has strategic partnerships with close to 90 women’s organizations though the North Texas Region. Like any startup, capital was a challenge in the beginning and being in the digital space, a lot of banks didn’t “get” what we were about in the beginning. We now have two banks as advertising partners. A platform that is targeted to women (who make up 80% of the consumer purchasing power decisions in this country) is resonating with companies wanting to get the message out about their product or service. Also, finding the right business partner was a huge differentiator for me. Sarah Webb is a CPA and former corporate executive who is our President & COO. Her business acumen and ability to build a successful team has set us up to scale nationally in 2018. Plus, she was willing to put financial “skin in the game” into the company. I laugh thinking about how many people thought (and occasionally today still do) think we are a non profit. I love non profits (and have served on many boards over my career) but Plaid is a for profit C-corp media company. 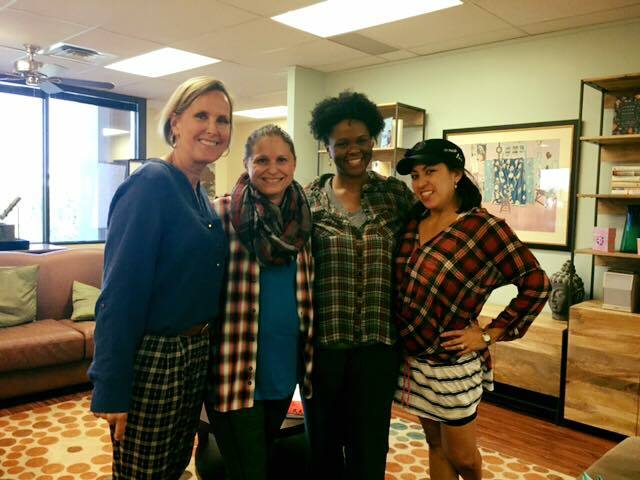 Plaid for Women – what should we know? What do you guys do best? What sets you apart from the competition? Our primary demographic are women ages 35 to 55, college educated with incomes over $100,000/year. We develop educational content with advertisers who want to get their product or service in front of our audience. Our differentiator is our #NoMeanGirls messaging which encourages women to love themselves FIRST in order for them to achieve their personal and professional dreams and to respect other women on their own journeys. We are excited to be hosting our first national #NoMeanGirls Women Supporting Women Conference Oct 6-8th in Dallas at the Marriott City Center. For more info, you can check out our site at: nomeangirls.com. Plaid has strategic partnerships with over 90 women’s groups and organizations throughout North Texas. Getting an email from a woman who said Plaid personified inclusion and gave her the courage to take risks and live an authentic life on her own terms. Can’t get much better than that. Plaid was honored with a Corporate Diversity Champion Award by the Texas Diversity Council in 2013 (we were only one year old) alongside BNSF and the Neeley School of Business at TCU. I felt like the Little Engine that Could. And we have.